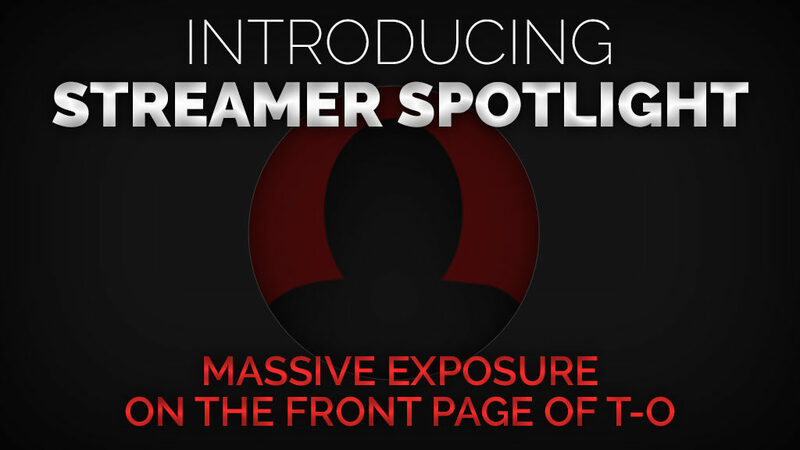 So WTF is Streamer Spotlight? It’s a new thing I’m starting for customers of T-O. It’ll be a nicely-sized box in that right-hand sidebar, with your picture, name, and a link to your stream. You’ll share the spotlight with 3 others (so 4 of you in total), and your details will randomly rotate as and when the site loads up. Okay, sounds great! How do I get in on it? All you have to do is be a customer of T-O, and at checkout be sure to tick “Yes” for the box that asks if you’d like to be considered. That’s it. I thought I should ask you first if you wanted to be considered, rather than just going ahead and including you. Some people may not want the attention, and that’s cool, so just tick “No” if that’s the case. I have to be a customer? So, do I have to spend loads for consideration? No, you’ll be included regardless of whether you’ve bought a $6 set of Stream Alerts, or a $42 full stream package – no one gets special consideration. Just, again, be sure to tick “Yes” in that Streamer Spotlight section on checkout! You keep saying “consideration” – what’s that about? It’s quite surprising how many people buy things, perhaps with the intention of streaming, and never actually get around to it. So I have to do a little quality control on my part, and manually choose people who appear to be streaming. Special consideration goes to those actively using T-O’s graphics, so be sure to make use of them as soon as you get them. How long will my Spotlight be active? The duration is something that will take a while to finalise, but currently it’s a full week (7 days), so take advantage while you can and enjoy a week of exposure to tens of thousands of potential new faces! When do you choose a new group for Spotlight? The plan is to refresh the chosen four every Tuesday. This means you can make your purchases any time up until this point (and remember to press “Yes” on the question at checkout), and you’ll be in contention to appear. Will I find out if I’ve been chosen? Not everyone leaves behind convenient contact/social information, so it’s quite difficult to notify people. Just be sure to check back in on the site each Tuesday (if you’ve bought something, of course), and perhaps your details will appear!